Dinh Nhat Uy celebrates his release outside the Long An provincial court after receiving a suspended sentence over his Facebook posts, Oct. 29, 2013. A court in southern Vietnam on Tuesday convicted an activist of “abusing democratic freedoms” in his Facebook posts on charges he rejected as unfair and a violation of the right to free expression in the one-party communist state. Dinh Nhat Uy, 30, who was detained in June after using the social media site to campaign for the release of his brother imprisoned on anti-state charges, was handed a 15-month suspended prison sentence followed by a year of probation, according to Uy and his lawyer. He was released from detention after the one-day trial in the Long An provincial court, but will effectively be kept under house arrest and strict surveillance during the suspended sentence and probation periods. His case marks the first time that Facebook, a platform widely used by Vietnamese activists to share information, has been specifically named in an indictment in the country, where authorities have in recent years stepped up a campaign to jail bloggers over online criticism of the state. Rights groups condemned the conviction, saying it was part of a reprisal against his calls to release his brother, blogger Dinh Nguyen Kha, who is serving four years in jail for distributing leaflets criticizing the Vietnamese Communist Party’s stance on disputed islands in the South China Sea. “As for the verdict, I think it is absurd and I have decided to appeal,” he said. Uy, who has also spoken out against Vietnam’s stance toward China on the islands, was convicted under Article 258 of the penal code, which bars “abusing democratic freedoms against the interests of the state” and carries a maximum sentence of seven years in prison. The indictment against him alleged that he had posted “bad and false information” criticizing Vietnam’s leaders and speaking out against a government attack on a human rights award. “That was my personal Facebook account [and] I have the right to write about myself on my personal page. I … only exercised my rights,” he said. Global press freedom watchdog Reporters Without Borders said Uy’s trial, attended by some 400 plainclothes police, was “bogus” and that its outcome had been decided in advance. “The sentence is one more example of how the authorities harass the families of jailed cyber-dissidents,” the group said in a statement. Outside the court, members of Uy’s family, denied permission to attend the trial, were detained during the hearing along with other supporters and protesters. “His family and friends heard about the sentence when they were still at the police stations,” Uy’s lawyer Ha Huy Son said. Protesters said some 30 activists, including well known dissidents and bloggers and others who traveled to Long An from Ho Chi Minh City, were taken away for questioning outside the court. Holding up banners calling for Uy’s release, the protesters chanted slogans until a large police van arrived to drive them away, blogger Peter Bui said. “They gathered all of us together and … ordered police to arrest all of us,” he said. Uy’s mother Nguyen Thi Kim Lien, who was led away by police along with Uy’s sister and nephew after police barred their entry into the courtroom, said she had never been notified of the court date or received a response for her request for permission to attend. “I wrote my petition to demand my right to attend the court, but the court did not respond,” she said. During the trial, Uy’s lawyers had argued to have the case transferred to a civil court and raised concerns about the prosecution process. Without evidence of damage to any party that was a victim in the case, the charges against him should have been civil instead of criminal ones, they said, arguing that the case should have been investigated by social and public order police instead of provincial authorities. “We argued at the court that their prosecution procedure was not in accordance with the law, and that the evidence did not show any physical and mental damages. Even if there were any damages, it should only have been a civil case,” Son said. Authorities have confiscated a cell phone, computers, and books belonging to Uy, who said he thought he should have been acquitted. “All that was needed was for [the facts] to be presented at the court in a transparent way, [allowing] the court to decide who was wrong and who was right,” he said. Global advocacy group Human Rights Watch has called Uy’s trial “the latest in a crescendo of proceedings” against Vietnamese political dissidents, with at least 61 being convicted and sentenced to prison so far in 2013, compared to around 40 for all of last year. Foreign governments, led by the United States, and international rights groups have criticized the crackdown and called for the activists' release. Vietnam recently introduced a sweeping new Internet law—known as Decree 72—that bans bloggers and social media users from sharing news stories online, in a move seen as a further crackdown on online freedom. No one has yet been charged under that law, which given the volume of content carried on Facebook would appear to be hard to enforce. 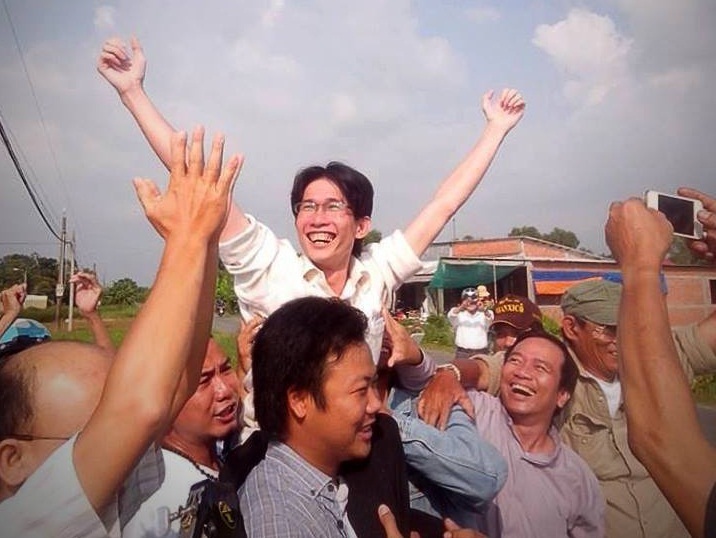 victory for free Vietnamese people, keep up with our momentum on Facebook !